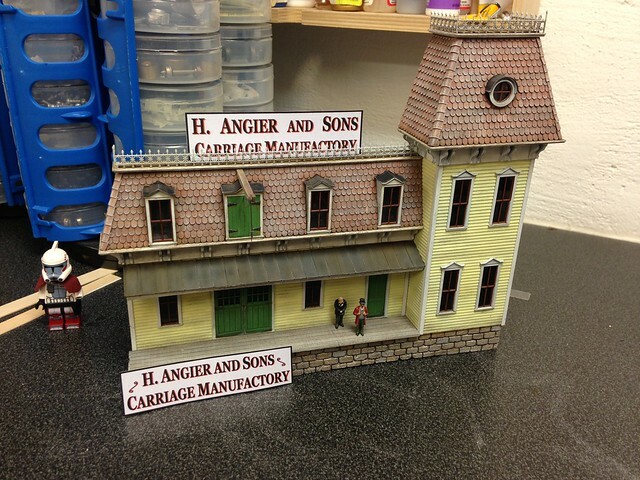 H�kan, the structure has come up great. Very American Gothic. I especially like the shingles and brickwork. Also enjoyed seeing you holiday pics. Some very unusual engines there. Looking forward to more updates. H�kan, It�s fantastic!!!!!! The color selection is perfect and the overall qualities are just stunning. It must have required great patience to do the shingles and it was well worth the effort. That is a great looking building, H�kan. I love those fish scale shingles that Walt sells, and you have colored them beautifully. Thanks Bob, you're right about a landing. I'll see if I could incorporate one. When I made the upper door I hadn't quite thought everything out. Thanks Bryan, I'll have a lot of detailing and signs to do before it is finished. Thanks Robert, I'm happy you liked it and the holiday pictures. Thanks Frank and Bruce! The shingles from Rusty Stumps worked great and were easy to apply with their adhesive backing. The only time I had trouble with them was when applying the shingles at the corners. The adhesive didn't adhere so well to the painted shingles so I had to use some white glue here. 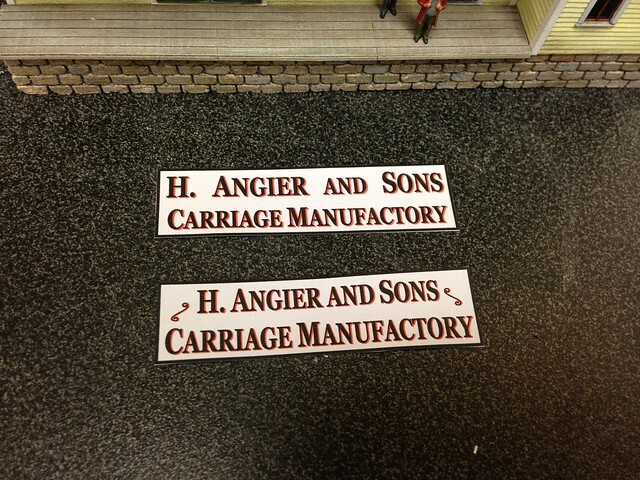 Been a busy day but I printed out two versions of the factory sign as seen on the picture below. I tried adding a red background for the letters to let them more stand out. I haven't quite received the effect I'm after. Perhaps other colors or more red in the background. Here's an idea: Look through texture sites (e.g. http://www.mayang.com/textures/) and find a weathered wood texture you like. Then layer your lettering on top of that texture, experimenting with different transparency settings (so the underlying wood texture shows through the lettering.) That might produce an effect you like. To answer your question, H�kan, I prefer the lower one. Thanks Dave and Dallas! Most helpful. That was one great looking sign Dallas, and with the look I'm after! Off course I have missed that thread. . Off for some experimenting. Thanks George, I'll feel best for that one too. Thanks Troels. I go for the one with the ornaments. And I would be very happy if you could show your techniques next time I'm visiting. This is getting crazier and crazier . I googled some old time signs and noticed that the letter shadowing nearly always was on the left side. I also noticed that many signs had dark background black, green and red with white lettering. Red feels a little daring so I tested the sign with green. An idea is to have the green matching the green on my doors but a little faded. Roughly, the no 2 is the faded version and no 4 is non-faded green. I could not find a single one that looked like my first version no 1 but the ones with white or light background looks very much like Dallas sign. Hi H�kan,my first thought when I first saw your sign was,I think that would look better on a dark background. I did not say anything,because you seemed to like the one with the white background. Like Henry Ford once said,"You can have any colour you want, as long as it is black"
I think a sign with a black background and red & yellow letters over top of each other like you have them now on the bottom 2, would look better. But that's just my opinion,that I have not kept to myself now.